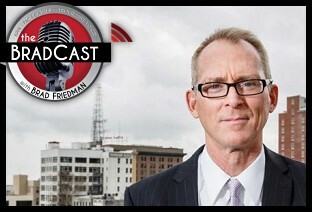 " Articles in Category: Bob Inglis	"
Six-term Republican Congressman Bob Inglis (SC) was my guest on today's BradCast, fresh off of being honored with the John F. Kennedy Foundation's Profile in Courage award earlier this week. After 12 years in the U.S. House, the very conservative Rep. Inglis was primaried out in 2010 by the Tea Party after he dared change his position from being a climate change denier to wanting to take action after consultation with scientists and even his own children. Inglis has since founded the Energy and Enterprise Initiative at George Mason University, "guided by the conservative principles of free enterprise and economic growth, limited government, liberty, accountability and reasonable risk avoidance to solve our nation's energy and climate challenges." We discussed whether he has any regrets about how things worked out in Congress; about his appearance in the new documentary Merchants of Doubt, which exposes how the denial industry works (and how the same sleaze merchants who denied the harm of cigarette smoke in previous decades on behalf of Big Tobacco are now using the very same tactics today. Watch the trailer. ); why Republicans have become science deniers and whether he is optimistic that will change any time soon; and his plan for a revenue-neutral carbon tax to fight global warming by both reducing emissions and correcting what he (accurately) describes as the "market distortion" that allows polluters to socialize the cost of pollution and, essentially, pollute for free. "One of the key philosophical underpinnings of conservative thought is that humans are responsible moral actors," Inglis told me. Yet, he says, the fossil fuel industry is being allowed to get away without taking responsibility for the damage they are causing to both people and the planet. "That's where we are on climate. We're allowing people to socialize their soot and they will get away with it as long as we let them get away without accountability." He says that was is currently lacking is "accountable transparent marketplaces." "If we could get through the denial and get to the debate," it would be a good thing, explains Inglis, who describes global warming as a "crucial issue, vital to the future of our children and grandchildren" as he offers a surprisingly optimistic outlook for the future. How optimistic? He even believes some non-denier Republicans may enter the 2016 Presidential primary race! I'm dubious --- but we'll see. It was a fascinating conversation.